As you build a marketing plan that will put your home front and center in buyers’ eyes, there’s no substitute for taking great photos of your home, inside and out. If your price, location and features meet their criteria, displaying your home in its best light will go a long way toward making a buyer want to visit your home in person. Our #1 Tip: DO add photos to your listing. Most house hunters won’t even consider looking at a listing that doesn’t include photos. DON’T include family members and pets in your listing photos. Your home is the main attraction, not how your family fits into your home. DO consider hiring a professional photographer. Unless you are a solid amateur photographer, it is well worth considering spending a few hundred dollars to have photos taken by a professional who has experience photographing homes. If hiring a pro is not in your budget, ask a friend who’s good at taking photos to do you a favor. DO make a shot list. Professional photographers make an outline of the types of photos they want to take before they start, and if you’re taking your own photos, you should too. Take a look at other online listings to get ideas for the types of photos that appeal to buyers. DON’T skimp on the number of photos you take. Set aside several hours to do a thorough job taking photos from different angles inside and out. Fill your camera’s photo gallery with lots of options for you to choose from so you can select the best photos to include with your listing. Buyers will see the outside of your home first. When evaluating options for those critical outside photos, stand in front of your home and take a visual assessment. How do the shades in the bedroom window look? Does it look nicer with the curtains in the living room drawn or open? Even if you live in a condo, you’ll want to include an exterior photo of your building from the street level. DO wait for a sunny day before you pull out the camera. The best time of day to photograph your home will depend upon which direction it faces. You’ll want the sun behind you, shining on the front of your home. DON’T take pictures of cluttered exteriors. Mow the lawn, trim any shrubs or trees, put the garbage can into the garage and close the door. Remove toys, sports equipment and gardening tools from the yard before you take any photos. When you move inside, look at your home’s interior from various angles and develop a list of areas that would be most photogenic and attractive to buyers. DO look at your home through a buyer’s eyes. What areas in a home would you most want to see in a flattering light when visiting in person? DON’T feel compelled to include photos of every room in your house. Unfinished basements and laundry rooms usually don’t photograph well. DO make sure that every room is clean, tidy, and well lit. Take photos from several angles and select the one that best represents the features or showcases the dimensions of the room. DON’T use a flash if you can avoid it. Natural light combined with lamp and overhead lighting offers a softer, warmer, more inviting look. DO find the best perspective. Take photos from the far corners of rooms and low to the ground to show as much flooring as possible. The more flooring you see, the larger the room will appear. Removing throw rugs from rooms that have attractive flooring underneath also makes them seem larger. DON’T feature your possessions. Think of your furnishings as props, and photograph the prominent design and architectural features of your house. 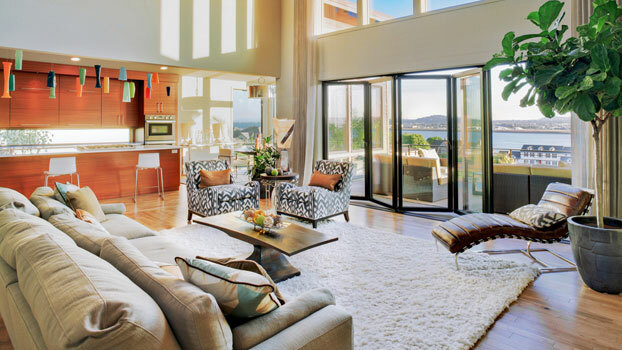 It’s more important to capture the big bay windows in the family room than it is your favorite leather sofa. DO include captions with your photos when you add them to your listing. Use simple language to explain the nature of each room. A final thought. Weeks may pass between the time you take your listing photos and your first showing, and we all know how long a clean house lasts, especially if you have little ones to chase after. Make sure you put your home back in order to match the photos so buyers aren’t surprised when they visit your home. And if you’ve made dramatic changes, like new paint or appliances, consider taking new photos.